facetime clocking systems are designed and manufactured in Great Britain, and prove to the world that we still have what it takes, when it comes to designing and producing a quality, cutting edge piece of electronic hardware. facetime clocking terminals have a rugged metal case to ensure longevity and peak performance in the most demanding Industrial environments. You have a choice of readers with each facetime clocking terminal, either magnetic strip, proximity card or key fob, or two types of biometric reader either fingerprint or hand geometry. Unlike most other software clocking systems which use a “dumb” clocking in terminal, that requires manual intervention to collect the clocking data. facetime is a “live system”, this simply means that whenever an employee or staff member clocks in or clocks out, the clocking is immediately and automatically sent to the software or server running the facetime clocking software. Each individuals, in, out or absent status is displayed onscreen by way of the attendance display panel (ADP). This ADP screen is available on any PC on the network. The facetime clocking software does not have to be running however, as the facetime clocking terminal is the “brains and intelligence” of the system, and does not require the software to be running in order for employees and staff to be able to use the system, when the PC or server is turned on and the software activated, both hardware and software automatically synchronise their data. 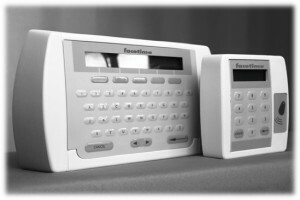 Auto Fire Roll Call Reporting – The facetime hardware will also allow connection directly to the fire alarm panel, when the fire alarm is activated, a signal is sent to the facetime clocking terminal which then initiates a fire roll call report either through the network printer or directly to a printer connected at the clocking terminal, this is very useful if the computer network is down or the facetime software is not running. The facetime clocking in software has a host of reports to show attendance and hours worked, overtime, lateness, early in, paid and unpaid absence by description and category of your choosing by pay period, date range. For those who use the Bradford Factor, there is a special report available for this also. In fact the reports are to numerous to mention, and if you have a special request we can create bespoke reports to your specification. If you would like a price or online demonstration of facetime please call or email contact us .